Length: 7 hrs. 43 min. There are three types of people when it comes to the future: those who will watch what happens, those who will make it happen, and those who will wonder what happened. Which will you be? Our society has widespread and unprecedented access to information, but what do we do with it all? Who do we trust to accurately track our societal trends, interpret them, and see possibilities for the future—and how can we help to shape that future? 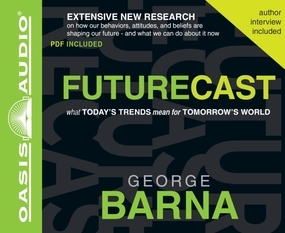 The answers lie in Futurecast, an insider glimpse of today’s world—and tomorrow’s. Researcher George Barna will inform you about the trends that are soon to change your life and environment, equip you to face them, and encourage you to stand among the visionaries who create the future rather than react to it.